This product combines the power two of our most high level nootropic stack guides and puts them together in one, discounted downloadable product that gives you 147 elite level nootropic stacks. 147 (total) Noopept and Racetam nootropic stacks, that are all perfectly formulated to induce powerful brain function. A stack list of sublingual Noopept combinations (under the tongue). A stack list of Oral Noopept combinations (ex: 15MG Noopept/75MG Triacetyluridine/100MG Alpha GPC/50MG Theacrine/500MG ALCAR/B Complex). A stack list and directions on using and benefitting from Noopept Nasal Spray. A stack list of Aniracetam nootropic stack combo. A stack list of Oxiracetam nootropic stack combos. A stack list of Phenylpiracetam nootropic stack combos. The Aniracetam Microdosing protocol stack. An Expert Piracetam nootropic stack list. Directions on dosing ALL racetams, and associated CHOLINE SOURCES. Cycling strategies on Racetams and Noopept. Induce faster speed of mental processing. Turn on high level cognitive function. 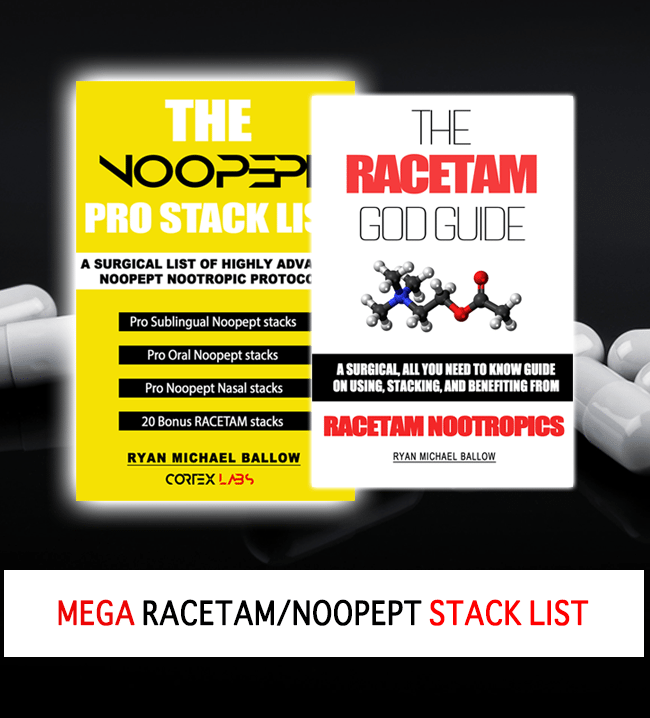 Within 5 minutes, you'll be emailed the files for the Noopept Pro Stack list and the Racetam God Guide. You can open them immediately on: iPhone | iPad | Android phone | Android tablet | Windows phone | Macbook | PC | Kindle device | Kindle application. The .mobi files are for KINDLE, the .EPUB files are for Android/iOS, and the PDF files are for Macbook and PC. It's YOUR CHOICE which ones you want to open. You'll have access to ALL OF THEM with this product. Simply open the files WITH the associated applications (iBooks for iPhone/iPad, Lithium Reader for Android, and the default PDF program on your computer if you read it on a PC or Mac), and start reading and using the powerful nootropic stacks inside! Add the product to your cart below. We'll email you in 5 minutes with your files.